Hey Munky! | The nature of Munky was... irrepressible. I like retro gaming t-shirts and I like bargains. This worked out quite well in that aspect. While doing a bit of shopping in Tesco (the one where I got the retro calendar) my other half suggested checking out their t-shirts. Tesco occasionally have some retro gaming t-shirts in, so amongst the tees we went. We saw a couple of Volkswagen tees, Avengers, Star Wars, tees I already own or have no interest in. I was about to get back to the shopping when I spotted a NES tee and a Space Invaders tee, individually packaged. The £8 label on the Space Invaders tee was easily visible and I thought it wasn’t a bad price. I then saw that both tees had been reduced to £4, got to love a twofer. The full t-shirt images can be seen here. …but the original XBOX (or XBOX Classic as I often see it now called) is venturing into that limbo area between “current” and “retro”. I never owned the original XBOX, I simply didn’t have the time to invest in one due to work and family life. I have, however, had an interest in maybe getting one for the emulation side of things. The idea of four player arcade emulation in the form of CoinOPS is something I think I would enjoy. …my eldest son works for a local charity and a few weeks back an original XBOX was donated to them. It came with a couple of the large controllers, original power supply and a damaged video cable. The damaged video cable meant that they were unable to properly test the XBOX even though it appeared to receive power and the optical drive ejected as expected. They were ready to bin it so I asked how much they would accept for it “as is”. They said I could have it for £8 and so I did. I reckoned even if the XBOX was scrap I could get my money back on the controllers. This afternoon I popped in to my local Tesco for a few things to see us through the week. My daughter was hounding us to buy a 2019 calendar and so we went to have a look at what they had available. Picking up a calendar my daughter said “Look at this”. I heard my other half say “We’ve got to have that one”. My daughter held up the calendar and I could see it was a retro movie & TV calendar. It held additional appeal for me because there was a “Reduced to Clear” label on the shelf (I’m a tight arse like that). It’s a nice little calendar although I’m not entirely sure about the Magnum P.I. picture. It looks like an alternate timeline version where Magnum was played by Ned Flanders. …and all the best for 2019. Elseworlds: The CW Supergirl/The Flash/Arrow crossover. It’s almost time for another CW crossover show, this time entitled “Elseworlds”. I was a little disappointed to see the Legends wouldn’t be involved in this one but I soon perked up when I found out that John Wesley Shipp‘s 1990 Flash incarnation would be appearing. I’ve posted before about my preference for Shipp’s Flash. Prior to Shipp playing the Scarlet Speedster I wasn’t a Flash fan. Shipp brought the character to life for me so it’s great that he’s back in the suit. I used to watch the show with my Dad; on Saturday’s if I recall correctly. My Dad passed away in 1995 so I’m a little saddened he’s not around to see the character back on the TV, I know he would’ve liked that. I came across this trailer earlier today and it gave me chills. Not only do I see Shipp’s Flash complete with crushed velvet suit but what’s that I hear? Yes, ’90s Flash theme. While browsing a local charity shop a couple of weeks back, amongst the Hi-Fi equipment, something caught my eye. A Philips CDi 210/45. A price label was just about visible as I leaned over some TVs to the shelving the CDi was sitting on. I pulled the unit closer and the price label had “£20 -no remote” written on it. I bought it anyway figuring I can get a remote later. Only vaguely recalling the CDi back in the day I decided to do a little research on the internet. There was a demo model up and running in Heward’s Home Stores I remembered seeing and that there were some really awful Zelda games for it but that was as much as I knew. Every review I read, every Youtube video I watched, every forum thread I found all spoke of a major irritant with the CDi. Even though there was a controller socket on the front the gamepad didn’t work in there, only the wired remote. Now, I have no idea what the people on these sites are talking about because I bought both kinds of gamepad on eBay and both work just fine in the front input socket. Unless my Philips CDi is some kind of unique unit there must be a lot of people out there in internet land with broken CDi’s. …and a very happy 2018. If anything ever really offered a true representation of the randomness of my life it’s been these last few weeks. It all started with a loose 510 connector on my Vaporesso Target Pro. The tank kept getting a wobble on so I stripped the base down to find the 510 connector is a “pop-on” type. I wasn’t going to open it up every other week to pop the connector back on so I decided to order a Fat Daddy v4 510 connector from http://www.modmaker.co.uk/. It arrived pretty quickly. I had to Dremel out the hole on the Vaporesso for it to fit but the final job was worth it. While my soldering gear was out I decided to do some of those soldering jobs I’d been putting off for a while. My first task was to composite mod my old Spectrum 48K. 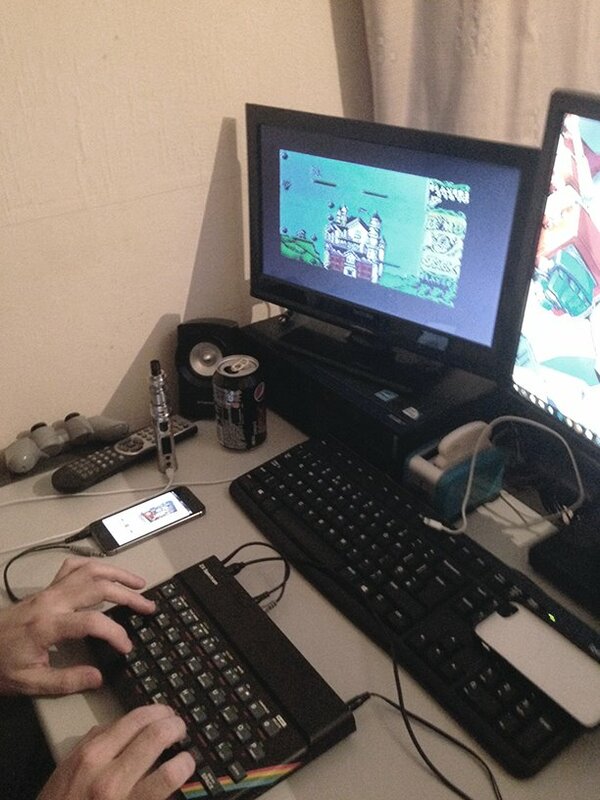 I took my faithful old Speccy out of storage and, before getting its composite on, I decided to take it for a test run. This presented me with a slight problem… I haven’t owned a cassette deck in 25 years. After finding a couple of games online in TZX format I converted them to MP3 and dropped them on to my iPhone. I know there’s a long list of people having already done this but I can’t help but love the ability of 30 year old technology running in harmony with modern technology. I’d been happily using my Kangertech Subox mini v2 for a while now. That was until, while dropping a new coil in the RBA deck, I managed to send it skooting along the kitchen worktop and into the washing up bowl full of hot water. I dried it out and it worked OK for a few months but after that it started crapping out on me, intermittently not firing up, etc. Fortunately my partner bought me a Vaporesso Target Pro for my birthday and I got a Vaporesso Gemini tank to go with it. Being an old skool gaming geek I just loved the retro Quickshot joystick look about it.